Today I am sharing a layout on the Scraptastic Club Store Blog using pieces from a few collections that coordinate very well together. When I was shopping in the Scraptastic Store this month, I picked papers and embellishments that I loved from different collections and manufacturers. Then the box arrived and I noticed right away that several of these lines are using the same range of colors with gold accents. This page uses products from the My Mind's Eye "On Trend" collection, the Jillibean Soup "Summer Red Raspberry Soup" collection, and the Crate Paper "Confetti" and "Craft Market collections. After finishing the page, it even appears that they are all from one coordinated collection. Supplies: Crate Paper - Confetti - Gala Paper, Jillibean Soup - Summer Red Raspberry Soup - Fresh Yogurt Paper, Jillibean Soup - Summer Red Raspberry Soup - Frozen Red Raspberries, Crate Paper - Confetti - Gold Star Vellum, My Mind's Eye - On Trend - Happy Paper, My Mind's Eye - On Trend - Chipboard Buttons, My Mind's Eye - On Trend - Sequins, Crate Paper - Craft Market - Ephemera Pack, American Crafts - Imprint Thickers, My Mind's Eye - On Trend - Enamel Shapes. The background paper (Crate Paper - Confetti - Gala Paper) has nice large white dots so I straight stitched around a few of them using Kreinik metallic threads from my stash. 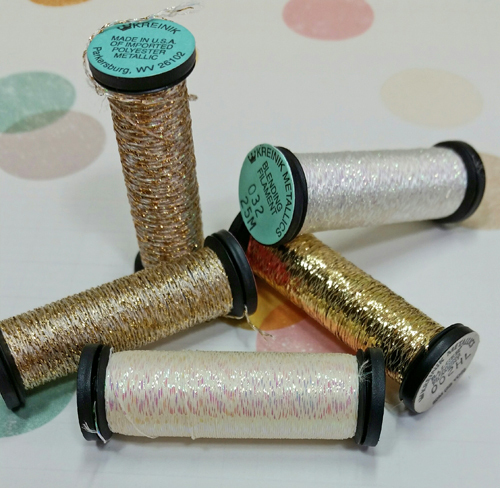 If you haven't used the Kreinik threads they come on these little spools in hundreds of colors and so many cool metallics. The gold accents of the papers, vellum, and embellishments help to tie all of the different collections together. I am more likely to use up my stash when I can easily coordinate like this. The flowers are cut from one of the Jillibean Soup floral papers. This is just gorgeous! and Happy Anniversary!